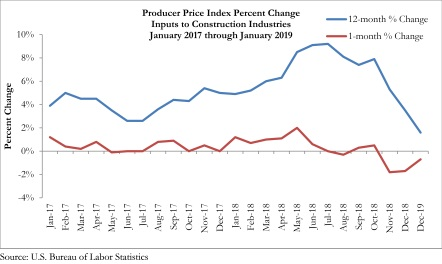 WASHINGTON— Construction input prices fell 0.7 percent on a monthly basis in January yet are up 1.6 percent year-over-year according to an Associated Builders and Contractors analysis of U.S. Bureau of Labor Statistics data released Thursday. Construction input prices have declined for three consecutive months and in four of the previous six months. “What a difference a year makes,” said ABC Chief Economist Anirban Basu. “In early 2018, contractors and their customers were being hammered by rapid increases in materials prices. Not only were prices rising, but there were concerns about the availability of certain precious commodities, including domestically produced steel. “Many factors were at work back then, including tariffs on steel, aluminum and softwood lumber,” said Basu. “The global economy was experiencing its first synchronized expansion in about a decade, with every major world economy expanding simultaneously. At the same time, nonresidential construction activity in the United States continued to gain momentum as economic growth accelerated in 2017 and well into early 2018 and business investment surged in the wake of corporate tax cuts.